Next week we will be getting a new president, and with him, a new Secretary of Education. With a new president comes a new cabinet. And since October 17, 1979, when President Jimmy Carter signed into law the Department of Education Organization Act—which brought into existence the overbearing and bureaucratic United States Department of Education—this has included the U.S. Secretary of Education. 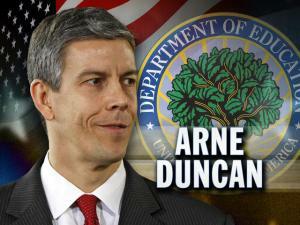 Arne Duncan, President Obama’s appointment, has fit the job perfectly, which is to say he intruded on public education like the big government politician he is. Now, before education advocates start belly aching about the importance of federally funded education programs, know this: on average, the federal government only contributes about 10 percent to a public school district’s budget (90 percent of funds come from state and local government). Interestingly, this doesn’t stop the federal government from bullying local school districts into following their laws and policies, like George W. Bush’s No Child Left Behind or Barack Obama’s recent “National Reform Model” for overhauling failing schools; the U.S. Dept. of Ed. wants all the power, none of the responsibility, and in exchange covers a measly tenth of the cost. Increase the use of data and standardized tests to define student achievement and teacher effectiveness. Use performance pay to compensate teachers based on student performance on standardized tests. End teacher seniority to give principals the autonomy to pick their own staffs. Turn “failing” schools into charters. Overhaul entire staffs of teachers and principals at failing schools. Reduce suspensions and expulsions to deal with unruly and disruptive students. After four years of such policies, the racial achievement gap is as big as ever, test scores remain flat, graduation rates haven’t moved, and hundreds of millions of dollars went down the toilet via President Obama’s education stimulus package; for those in Philadelphia, think of the three year tenure of Arlene Ackerman, and the nearly $10 billion she spent (stole/wasted). What does Philadelphia have to show for it? A gigantic budget deficit. Which is why a new education secretary is going to be a much-needed breath of fresh air. The question, of course, is who? Who will Romney’s education secretary be? Before that question can be addressed, there is one fact that will make his appointee better off than Duncan: Romney has talked of shrinking the U.S. Dept. of Ed. by combining it with another agency, and this may limit the reach of the education secretary; some speculate that there is still a chance Romney will abolish the Dept. of Ed.—and education secretaries—altogether. Again, the federal government only contributes about 10 percent to the budgets of public school districts (in Philadelphia it is about 15 percent), so the Dept. of Ed.’s power should be reeled in; it should have a say in only 10-15 percent of public education policy. But that’s not how big government and big bureaucracies operate. They want control at all costs, and maneuver their way in via handouts (Race to the Top) and by making false promises; better to give federal education funds directly to the states, and let local districts, school boards, parents and teachers make their own decisions. It’s interesting more public educators aren’t more agitated by the U.S. Dept. of Ed., by its intruding reach into their classrooms, by its regulations and red tape, by its out-of-touch policies and visions for reform. Perhaps the most intrusive, frustratingly bureaucratic years in the past two decades in the Philadelphia School District were the Ackerman years from 2008-2011, driven by scripted curriculum and suffocating central office visits from the clipboard wielding Ackerman Gestapo. This period was the direct result of Obama/Duncan’s “National Reform Model,” AKA: gotcha policies and stifling regulation trickling down from the control freaks known as the U.S. Dept. of Ed. So who will Romney pick as his education secretary? Here’s a list of possibilities, according to Education Week: Minnesota’s Tim Pawlenty, Tony Bennett (Indiana’s superintendent of Public Instruction), Tom Luna (the Idaho superintendent of public instruction), Chris Cerf (a registered Democrat who works with GOP governor Chris Christie), Robert Scott (former Texas chief), Paul Pastorek (helped schools in Louisiana recover from Hurricane Katrina), Bill Green (executive chairman at Accenture, a consulting organization), and Joel Kline (former New York City chancellor), among others. (To read about their backgrounds on education, click here). But the best hope, of course, is that Romney won’t pick a new secretary. That is to say, that the newly elected president will make his first order of business to send the U.S. Dept. of Ed. the way of the blue suede shoe, and allow local school boards, parents, and teachers the true freedom to drive policies and reform. Tagged as Arne Duncan, Barack Obama, George W. Bush, Jimmy Carter, Mitt Romney, No Child Left Behind, Standardized Tests, U.S. Dept. of Ed. President George W. Bush brought us No Child Left the Behind, President Obama, brought us Race to the Top. Sadly the difference is the same. And if you are right, what will Romney bring us. Cant wait to read your post election commentaries. Thankfully, President Obama will be re-elected, so we won’t have to deal with Romney’s disingenuous attitude towards teachers. Should Republicans take charge, we would see more cuts to education and more disrespect aimed at teachers. However, Duncan must go. I, too, look forward to reading your blog after the election, when your commentaries return to addressing topics that are more educational and less political. Some of the names on Romney’s list (Klein and Cerf come to mind) are really not much different than Duncan. They’re all part of the same machine. -Increase the use of data and standardized tests to define student achievement and teacher effectiveness. -Use performance pay to compensate teachers based on student performance on standardized tests. Is this not the same complaint the students of Stuyvesant NYC HS were making with the use of one test to evaluate what they could or could not do? Seems no one likes one piece of data to evaluate what they can and cannot do. Any remember it was a Democratic city and unions who got you your free health care paid for by tax dollars. Enjoy while you have it, cause it won’t be there when you retire. You will then join the rest of us in the free market health care system. My health care again went up $100/month as it has every single year since I retired. Does Romney have any plan to help old retired school teachers like me who have to buy health care? So Chris, you were saying……?